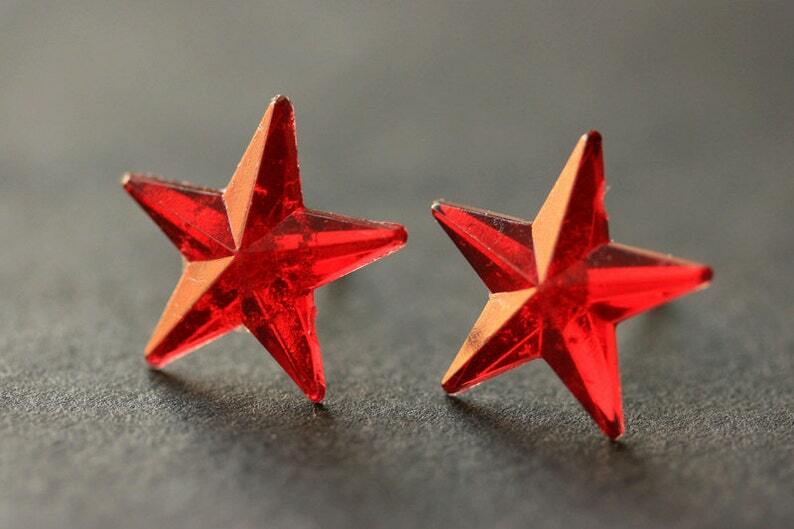 Red Star Earrings. Red Earrings. Silver Stud Earrings. Star Earrings. Post Earrings. Handmade Earrings. Handmade Jewelry. Vibrant shimmering red stars have been set on silver plated earring posts complete with matching earring backs in this pair of handmade earrings. Star size is available in both 9mm (1/3 inch) and 13mm (1/2 inch). These earrings also come in Cobalt Blue and Amber Gold! Royal Blue Star Earrings. Cobalt Blue Earrings. Silver Stud Earrings. Star Earrings. Post Earrings. Handmade Earrings. Handmade Jewelry. Clear Butterfly Earrings. Clear Earrings. Silver Stud Earrings. Butterfly Earrings. Post Earrings. Handmade Earrings. Handmade Jewelry. Red Heart Earrings. Red Earrings with Silver Stud Earring Backs. Handmade Jewelry. Black Flower Earrings. Black Earrings. Gardenia Flower Earrings. Silver Stud Earrings. Black Rose Earrings. Handmade Jewelry. EASTER SALE Bluebirds Charm Necklace with Wire Wrapped Cobalt Blue Teardrop and Pearl. Handmade Jewelry. EASTER SALE Blue Butterfly Charm Necklace in Bronze with Wire Wrapped Blue Teardrop and Pearl. Handmade Jewelry. EASTER SALE Butterfly Locket Necklace. Autumn Butterfly Necklace with Wire Wrapped Teardrop and Pearl. Handmade Jewelry. These were a wonderful accessory for my Bombshell Wonder Woman costume recently! Just as photographed. They go nicely with my Wonder Woman comic book pumps. Cheers! Arrived quickly and exactly as described. Super cute! Turquoise Flower Earrings. Turquoise Earrings. Gardenia Flower Earrings. Silver Stud Earrings. Turquoise Rose Earrings. Handmade Jewelry. Glass Teardrop Earrings in Silver. Dangle Earrings. Drop Earrings. Silver Wire Wrapped Elixir Earrings. Silver Earrings. Handmade Jewelry. Mist Gray Rose Earrings in Silver Stud Earrings. Flower Jewelry by StumblingOnSainthood. Handmade Jewelry. Pale Pink Starfish Earrings. Pink Star Earrings. Pink Earrings. Silver Stud Earrings. Star Fish Earrings. Post Earrings. Handmade Jewelry. Rhinestone Starfish Earrings. Silver Starfish Earrings. Post Earrings. Star Fish Earrings. Silver Earrings. Stud Earrings. Handmade Jewelry. Red Flower Earrings. Red Lotus Rose Earrings. Post Earrings. Red Earrings. Silver Stud Earrings. Red Lotus Earrings. Handmade Jewelry. Ivory Rose Post Earrings in Bronze. Rose Earrings. Flower Earrings. Stud Earrings. Handmade Jewelry. Orange Lotus Flower Earrings. Orange Lotus Earrings. Silver Post Earrings. Orange Earrings. Stud Earrings. Handmade Jewelry. Purple Daisy Flower Earrings with Rhinestones and Silver Post Earrings. Handmade Jewelry.